There’s something about the phrase “top educational websites for children” that makes my stomach feel ill. It may be because I imagine parents plopping their children in front of a PC and only allowing them to play games that involve solving math problems or answering science questions. The torture! However, I was from a generation where even though I was an “A” student, when I returned home I’d immediately race to the computer and fire up the game Ultima for an evening of medieval adventure. With that said, I do feel that today parents have a far greater selection of fun games or sites that are also educational and won’t bore your poor kid to death. In order to produce a quality list, I started at KidSites, which is sort of the “Google” of children’s websites. The folks there accept submissions of sites and then offer the Internet community a directory of the “best kid sites on the web.” However, the directory is huge, so I’ve decided to produce a list of only the top educational websites for children that are so much fun that even though they are considered educational sites, your child won’t even know it. I’ve selected the best site from each educational category. Many of the sites at KidSites can be amateurish or boring, so it can take some searching to find that special gem of a site. In the Arts category, my own personal favorite comes from The Metropolitan Museum of Art in New York City. Their section for kids features a long list of online applications where kids can learn about color, go on Aaron’s Awesome Adventure (the site will even read the story aloud to your child! ), as well as a long list of other fun games and activites that exposes kids to the exciting world of Art. 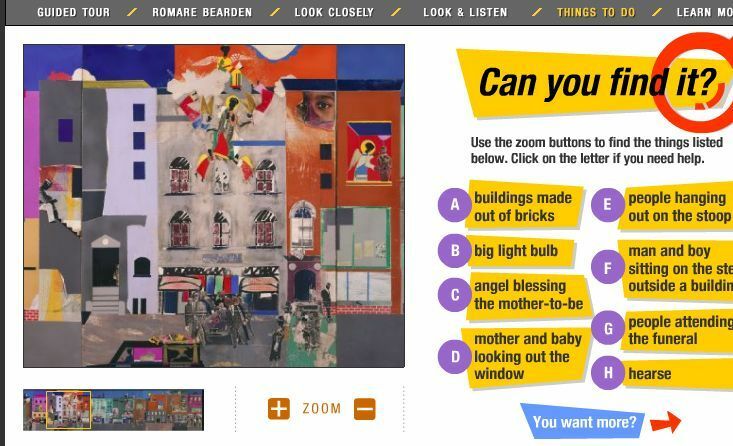 My personal favorite comes from artist Romare Bearden, a unique urban artist who produces some of the coolest art I’ve seen. His own website application for kids offers them activities that they can do with some of his art – I don’t know a kid alive who wouldn’t have a blast with these activities and the graphics. To think that this is just one small section within a larger kid’s activity area of the Metropolitan Museum of Art’s website is impressive. As always, you’ll find the best designed websites from larger organizations with the funding to hire people who can produce the best web applications for kids. The same must hold true for NASA, because they appear to take their mission of educating the public very seriously. NASA offers the “NASA Kids’ Club,” an interactive section of the NASA website where kids can learn about space and what it’s like to be an astronaut. The games are actually fun, while your child will learn science. 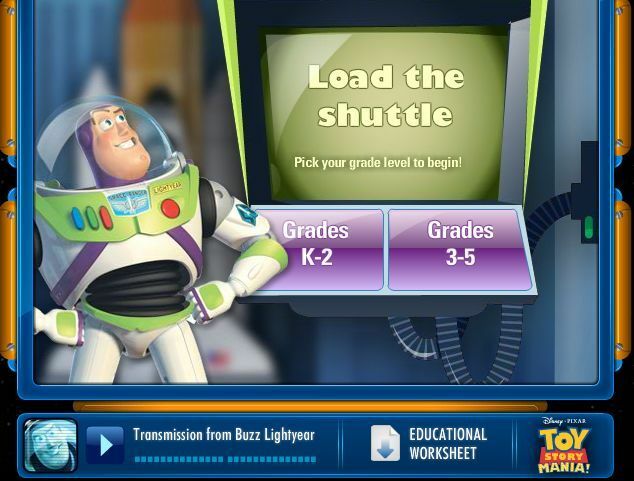 Even Buzz Lightyear makes an appearance in a game where your child helps Buzz prepare to head out into space. The graphics are obviously impressive, but the storyline and activities will hold your child’s imagination captive while they actually “learn” something about science and space…image that. Sure, this is obviously another category under “science,” but if you’re a “Green” family, or you’re really into animals, it’s an important one. The world is filled with an endless array of natural wonders and stunning places for kids to learn about, and it makes sense that National Geographic would be the entity that would offer the best nature site for kids with National Geographic Kids. This website has amazing images and explanations of animals and places on earth for kids to explore. Of course they do also have interactive sections like an online coloring book and a games section. 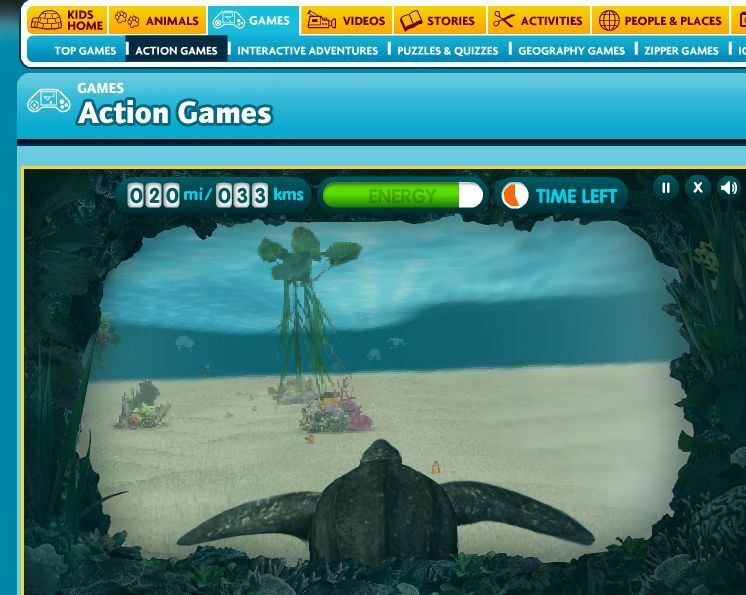 And yes, the games section is very cool, with one game where you race a turtle in a scene that is reminiscent of Finding Nemo. Your child will attempt to swerve and dodge the various undersea objects, animals and plants. Okay, not terribly educational of course, but totally fun! And when your kid is done, they can go back to reading stories or learning about animals on the other sections of National Geographic kids site. The best site for this category didn’t come directly from KidSites, but instead I had to drill down into PBS.org, which provides a number of submissions to KidSites. One of the best areas of PBS for kids is PBS Kids Go! for older kids, although PBS also offers “PBS Kids” for younger children. Both websites certainly prove that PBS is still king of the hill when it comes to providing content for children that’s both entertaining and educational. 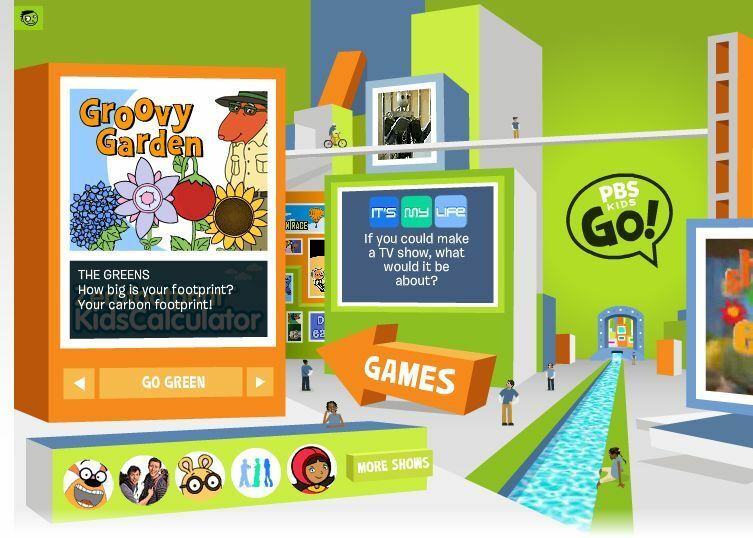 The wide array of really cool games on the PBS Kids site will keep your child learning for hours. 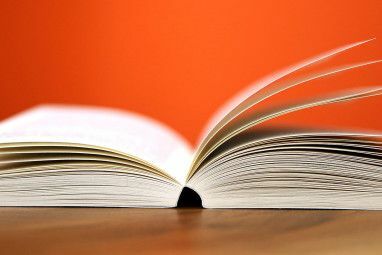 Your child will learn about living green, histor y and just about every other subject. Keep in mind that your kid will learn far more if you take some time to play these games with them, and they’ll certainly learn more because you’ll be available to talk them through the lessons that each game teaches. The last category that is important to cover, I needed to search other than the KidSites website, and I’m glad I did. By far, the folks who know the most about music are those who run the major symphony orchestras from around the country. So, it makes sense that the best educational website within this category comes from the San Francisco Symphony, with their impressive website SFS Kids – Fun With Music. There are all kinds of really cool activities for kids at this site. 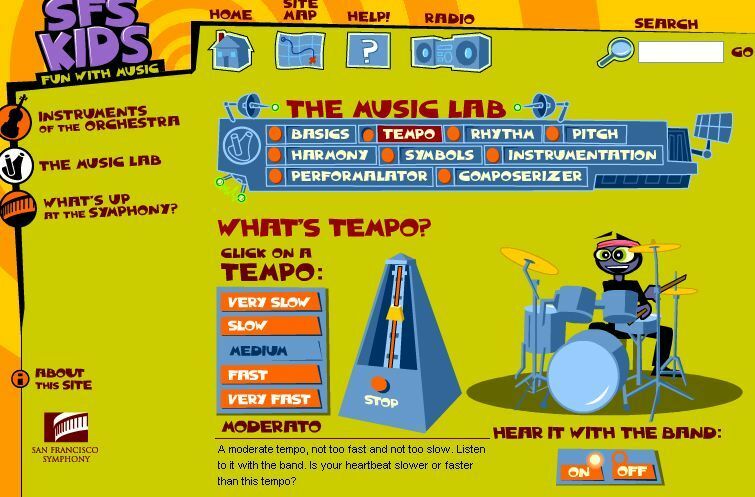 The best example I found was “The Music Lab,” shown above, where kids can learn about tempo, rhythm, pitch and other aspects of music through an awesome interactive game. As they adjust the music, they can watch the metronome and listen to the music being played to learn about how the various elements of sound come together to make beautiful music. 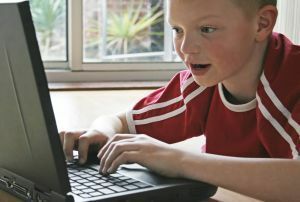 Do you have your own favorite websites where you like to have your kids spend their “online” time? Share your own favorites in the comments section below! this is amazing !! this is very good for children! !they have a math games,puzzle,mazes,flashcardsâ€¦.. Yes I agree with the above all content and comments. Surely this will helpful for children in gaining knowledge. Another good one for the younger set is http://www.lil-fingers.com for storybooks and coloring. I love this one! 5 Diferent languages! Try FactFreaks.com - Best Basic Math 'Edutainment' site available. New and worth a look. The kidgurus.com is a great place to chat with people all over the world and make new friends, to learn about every subject possible and to have a great deal of fun and entertainment. The kids can post free stories, essays and they can upload free videos, photo albums, and games. This is a great list. Especially since I have a 9 year who is a professional web browser. I am always looking for safe websites for him. We make educational rap music for middle- and high-school students. So far we have four standards-based, full-length albums (math, science, language arts, and social studies), and each song comes in four versions to assist with learning and teaching. Great article. As a teacher I'm using the games by http://www.bontegames.com regularly in fun logical skill training context. Tons a activities for kids from 3+ including sounds, music, colors, alphabet etc..
My son learned how to use a mouse, click and drag-n-drop with this site. Another good site for young kids is Ziggity Zoom. 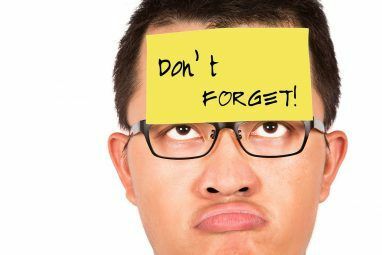 great list of Educational Websites for children but what about those people who are college going and searching good Educational Websites for there benefit.